There are few things quite as annoying as dropping your pristine iPhone 6 face down on the ground and then retrieving it only to reveal the horror of a cracked screen. Not only is a cracked iPhone 6 screen extremely aesthetically displeasing, it also makes your phone very uncomfortable to use, if it still works at all that is. A cracked iPhone 6 screen is really frustrating, leaving you cursing yourself for clumsily dropping it or letting it slide out of your shirt pocket. It's an easy enough mistake to make when you're in a rush or just caught out by carelessness, and we've all been there. But as frustrating as it is, it is not the end of the world, thankfully. Carrying out a DIY screen repair on your iPhone 6 is a relatively quick, simple and affordable process which will leave your phone looking brand new again. No-one should have to live with a cracked iPhone 6 screen. Even if the phone itself is still functional, a cracked screen is a real eyesore when you're showing off photos on your phone and can be uncomfortable or even dangerous due to the risk of cutting your fingers on the fractured glass. Depending on the extent of the fracture, it can also make it really difficult to read text messages and browse the internet or look at Facebook, Twitter and the like. Whilst a small crack can simply be mildly annoying, a large crack across the whole screen can render the phone practically useless. These days it's easy to purchase a replacement iPhone 6 screen and carry out the repair yourself, saving you from having to resort to the drastic measure of splashing out on an all new handset. In no time at all you'll have your phone looking as good as new with a minimum of hassle. This is also a much more economically viable option when you compare it to replacing the handset completely. 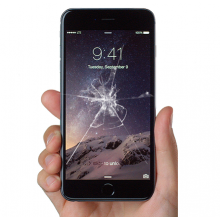 With a brand new iPhone 6 handset costing upwards of £400, it's not difficult to see why opting for a DIY repair with a replacement screen is an increasingly popular choice. It's easy to jump online, order the parts you need yourself and then have them delivered straight to your doorstep so that you can carry out the repair at your own convenience. The repair of an iPhone 6 screen is a relatively straightforward affair which can be carried out fairly quickly. It shouldn't take too long, don't rush it however! Be sure to carry out plenty of research via video guides and articles online which will be able to give you detailed advice and instructions to guide you on your way with the repair. Doing it yourself is definitely the cheapest option and therefore makes the most sense, especially when you take the current economic climate into consideration. The expense of buying a whole new handset is needless when you can simply order the replacement screen for you iPhone 6 and repair it yourself. Apple iPhone 6 complete replacement screen in black. This black iPhone 6 screen comes complete with the LCD and touch sc..
Apple iPhone 6 complete replacement screen in white. This white iPhone 6 screen comes complete with the LCD and touch sc.. Original Apple iPhone 6 Plus complete replacement screen in black. This genuine original black iPhone 6 Plus screen co.. Original Apple iPhone 6 Plus complete replacement screen in white. This genuine original white iPhone 6 Plus screen co..